President Donald Trump is making his case Tuesday to the American public that the country is facing a "humanitarian and national security crisis" at the U.S.-Mexico border and needs a wall to thwart illegal immigration, a dispute with lawmakers that has resulted in a partial 18-day government shutdown. Trump is delivering a prime-time, nationally televised White House address, before traveling to the border on Thursday. "He'll be laying out the facts to the American people of what is a genuine humanitarian and security crisis at our southern border," Vice President Mike Pence told CBS in an interview ahead of Trump's speech. House Speaker Nancy Pelosi and Senate Democratic leader Chuck Schumer, who oppose Trump's demand for more than $5 billion in funding for the wall, are planning their response to the president immediately after his address. Pence reiterated that Trump is considering bypassing Congress to build the wall without approval from lawmakers by declaring a national emergency and using funds allocated for military construction projects, but did not say that Trump would make such a declaration in his speech. The standoff has shuttered about a quarter of government operations since Dec. 22. Pence blamed Democrats for the shutdown, already the second longest in U.S. history, although Trump has said he would take responsibility for it. Democrats have called on Trump to reopen the shuttered agencies whose work is unrelated to his wall proposal, while continuing to negotiate on funding for the Department of Homeland Security, which controls border operations. The White House has refused, however, and the shutdown continues with no end in sight. "We could resolve this in a matter of hours if the Democrats would come to the table and start negotiating in good faith," Pence said. Democrats and several immigration advocates say the administration's representation of the issue is inaccurate, and accuse it of manufacturing a crisis for the political purpose of building the border wall, which Trump campaigned for as a presidential candidate in 2016. House Speaker Nancy Pelosi and Senate Minority Leader Chuck Schumer issued a statement late Monday calling for television networks to give Democrats a chance to respond to Trump's speech, saying that his history suggests the address "will be full of malice and misinformation." 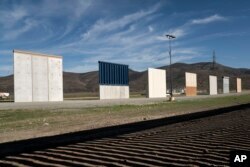 They also said the president needs to accept that his wall plan does not have sufficient support in Congress. "Democrats and an increasing number of Republicans in Congress have repeatedly urged the President and Leader McConnell to end the Trump Shutdown and re-open the government while Congress debates the President's expensive and ineffective wall," Pelosi and Schumer said. 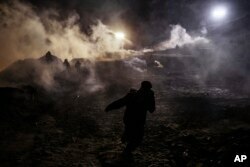 Migrants run as tear gas is thrown by U.S. Border Protection officers to the Mexican side of the border fence after they climbed the fence to get to San Diego, California, from Tijuana, Mexico, Jan. 1, 2019. Asked at what point workers' pain outweighs the president's desire for a border barrier, Pence said the administration understands the burden faced by government workers but hopes "we don't find out." Responding to Democrats' request, the Office of Management and Budget sent a revised estimate for the proposals for wall funding to the U.S. Senate's Appropriations Committee. Along with $5.6 billion for the wall, the administration has called for another $800 million for "urgent humanitarian needs" to take care of migrants at the border. Tax professional and tax preparation firm owner Alicia Utley reaches for hard copies of tax forms at the start of the tax season rush in her offices in Boulder, Colorado, Jan. 14, 2017. Russell Vought, OMB's acting director, said tax refunds for Americans will be processed and will not be considered "non-accepted activities" during the shutdown. "We are making this as painless as possible, consistent with the law," he said. 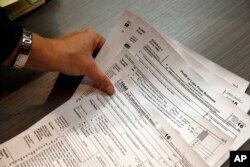 Pelosi called it "an action necessary to make sure working families received their tax refunds on schedule." Opposition Democrats have refused Trump's demand for wall funding, but offered $1.3 billion in new spending for border security. Semantics may provide negotiating room over the impasse, as Democrats appear more amenable to approving money for "fencing" rather than a "wall" and Trump is now saying he would agree to a steel barrier instead of a concrete wall. On Dec. 21 he tweeted a photograph of a "steel slat barrier" he called "totally effective while at the same time beautiful!" "If in fact a compromise emerges, it will be over a change in some of the rhetoric," said Steven Billet, legislative affairs program director at the George Washington University. He added that once "we start talking about border security as an alternative, we may be able to find a way to provide some funding that is satisfactory to the president and House Democrats." Speaking to reporters Friday, Trump said, "I think we are probably talking about steel, because I really feel the other side feels better about it, and I can understand what they are saying."